Protestors at the 2017 Unite the Right rally in Charlottesville preparing to enter Emancipation Park. Plaintiffs in a federal lawsuit against white supremacists involved in the deadly 2017 Unite the Right rally have asked a judge to penalize defendants for refusing to hand over evidence. 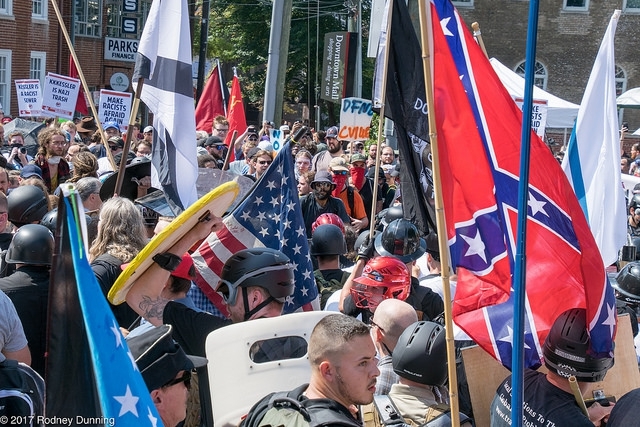 The lawsuit, filed in October 2017, names about two dozen individuals that the plaintiffs say conspired to incite violence in Charlottesville. Defendants, including Richard Spencer, Elliot Kline and Matthew Heimbach were asked to submit electronic devices and passwords to their social media accounts. But attorneys on behalf of the ten plaintiffs say many have ignored that request. Amy Spitalnick is executive director of Integrity First for America, the organization funding the lawsuit. “They have seemed to try every trick in the book to avoid accountability under our legal system,” she said. Spitalnick said the plaintiffs have asked the court to inform the jury that Kline and Heimbach in particular intentionally defied court orders while continuing to post on social media. Attorneys for the plaintiffs have struggled to get a number of defendants to hand over evidence in this case, including from Jeff Schoep, the former head of the National Socialist Movement. They also claim Schoep fired his attorney to avoid signing a contract that would require him to turn over his devices for evidence. At the time of the order, plaintiffs argued the most egregious violations of court orders and required evidence collection had been from Schoep. Schoep told WCVE last month he was working to comply with the judge’s orders. The trial was originally expected to take place this summer, but, according to Judge Hoppe, has been postponed due to delays in the discovery process.